Consumer demand for non-dairy options has spawned a whole new beverage category—rice, nut, grain, and soy (RNGS). The most popular of the category had been soy milk, however, sales of almond milk have been rising steadily and are projected to see continued growth in the next five years. One reason for almond milk's rise is consumer preference for the flavor of almond milk over soy milk. All of these factors contribute to new consumer demand and the related rush of new product development in the non-dairy beverage category. With a broader category comes more variation in labeling claims, ingredients, and processing capabilities which creates the need for new stabilizer solutions to address the various combinations. The one advantage cow's milk has over its non-dairy counterparts is its innately higher level of protein that remains in suspension with little to no stabilization. For manufacturers formulating non-dairy beverages and desiring to provide similar levels of protein in their product, fortification is normally required, which often increases the need for a stabilizer. 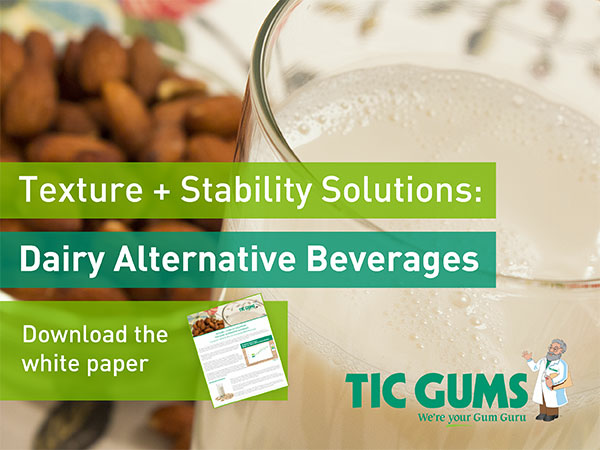 Specially designed to stabilize almond milk beverages and suitable for other dairy alternative beverages, Ticaloid® Pro 181 AG is a gellan-based solution that suspends, emulsifies, and enhances texture. Ticaloid Pro 181 AG is the newest product in our Ticaloid Pro line of ready-to-drink beverage stabilizers. Using our texture mapping process, our Gum Gurus compared the texture of almond milk made with Ticaloid Pro 181 AG to that of almond milk made with the traditional carrageenan/soy lecithin stabilizing and emulsifying system. Their work found no significant textural differences between the two systems. Jacobsen, Jessica. "Dairy Alternatives Continue to Increase Market Share." Beverage Industry. BNP Media, 12 Nov. 2015. Web. 26 Apr. 2016. Watson, Elaine. "Packaged Facts: Almond and Coconut Milk on Fire; Soy Milk on the Skids; Skim Milk Losing Share." FoodNavigator-USA.com. Food Navigator USA, 21 May 2015. Web. 26 Apr. 2016.